Exeter's Tom Nichols (left) has been linked with a move to Posh. Photo: David Davies/PA Wire. Peterborough United were today (January 11) linked with a move for Exeter City striker Tom Nicholls. The 21 year-old scored for Exeter in the 2-2 third round FA Cup draw with Liverpool last Friday (January 8), one of the 10 goals he has scored this term. The Exeter Express and Echo newspaper made the link today. They also believe League One sides Barnsley, Wigan and Coventry are tracking Nichols. Posh are expected to sell top scorer Conor Washington during the January transfer window so they will be in the market for a striker. 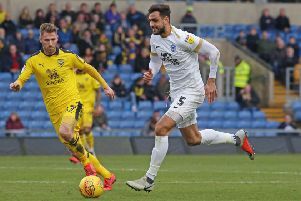 Posh chairman Darragh MacAnthony revealed last week that he has a hit list of the top young talent in the UK should he lose any of his star men. Reading are believed to be one of three Championship clubs to have seen multi-million bids for Washington rejected last week. Wolves, who sold star striker Benik Afobe to Bournemouth over the weekend, Birmingham, whose star player Demarai Gray moved to Leicester last week, and Cardiff have also been linked with Washington. The Non-League paper has reported that Posh have awarded recent trials to Nuneaton Borough players Aaron Williams and Zeus De La Paz. Striker Williams spent time on trial at walsall last season. Goalkeeper De La Paz has played for Holland at youth level. Nuneaton are among the promotion chasers in the National North Division. Peterborough United chairman Darragh MacAnthony has already refuted two striker signing rumours. Posh had been linked with Matty Taylor (Bristol Rovers) and Moses Emmanuel (Bromley), but MacAnthony insists neither is on the club’s radar. Suggestions that teenage striker Jonathan Edwards had been a target for Premier League sides Watford and Norwich City appear to have been dismissed as the player yesterday extended his loan at National League South side St Albans City until the end of the season. Posh winger Marcus Maddison has reportedly been the subject of interest from a handful of Championship clubs.